If you're like me (and you're a Linux Journal reader, so you may actually be like me), you probably rotate through your cell phones and/or tablets every couple years. These little devices are so convenient and have been consistently dropping in price, while their power continues to go up, so you may have a few older devices sitting in a drawer. Thank Moore's Law for that—but what can you do with your old devices? There are a couple obvious things to do with old devices: some phone carriers allow you to "trade up", or you can hand them down to your kids or friends. However, there are quite a few uses for old devices aside from just pawning them off on your friends or disposing of them. This article is geared primarily at Android devices. Some of you may have older Apple iOS devices (it's okay if you do, I do too), and I'll drop hints on how to re-use those devices as well. With that, let's get started! This may be an obvious choice, so let's lead with it. Re-using an old device as a dedicated media player is easy and doesn't require much work. Just load up the device with your media of choice, and rock out! If you really want to get obsessive though, install the Plex Media Server running on a computer at your home, get the Plex Media Client for your mobile device (it's available for both Android and iOS) and turn your old smartphone into a media-streaming machine! This is another obvious choice, but surprisingly easy to forget about. Simply upload any pictures you'd like to display, and then set the gallery/photo program to display them in a looping slideshow. Smartphones generally have the ability to record video. Why not utilize that ability to have your own little wireless security camera? You can use the app IP Webcam if you're on Android (or Presence for iOS), and turn your old phone into an effective way to monitor your home. Alternatively, if you've got a small child, set it up in his or her room to act as a video-equipped baby monitor. I wish this would have been possible when our daughter was little. It would have saved my wife and I a lot of tiptoeing into the kid's room to check on her...without waking her up, which was always a trick. When I saw someone do this, I thought, "Why didn't I think of that?" It's just that simple. Put an old phone or tablet on the counter, use its timer while cooking recipes, and have its Web browser up and running to display recipes while whipping up food in the kitchen. There's another trick that a smart device can do for you in the kitchen too. You can use its calculator to help do the math for doubling up ingredients for recipes. Who cares if you accidentally get the old phone full of frosting or flour? Just make sure it doesn't find its way into the oven—lithium-ion batteries don't take well to baking at 350°F for a half-hour. If you're a heavy Skype or VoIP user, why not re-use your old smartphone as a wireless handset for those services? Even an HTC Dream or iPhone 3GS has enough CPU to run VoIP applications, if it's not forced to do anything else. Bonus points if you pair that with a Bluetooth headset for double the wireless action. If you're not a VoIP user, and prefer to use old-school messaging services like IRC, just drop a copy of Andchat on your Android phone (or Colloquy for iOS), configure it up, and have fun chatting like it's 1998. Optionally, you can set up a crazy Irssi proxy and bouncer to keep you connected 24 hours a day, seven days a week (see Resources for a link to the Linux Journal article on this). This may be one of my favorite uses for an old smartphone or tablet—so much so, that I have one of these on my desk at work. There are a lot of emulators available for Android for your favorite arcade or console systems, although though you may have to scour the Google Play store to find them. This also assumes you have a library of ROMs as well. It's possible to do this on iOS devices too, but you may have to jailbreak the device. When you're all done, you wind up with a really cool little arcade system, especially if you pair it with an iCade or iCade Jr. Figure 1. 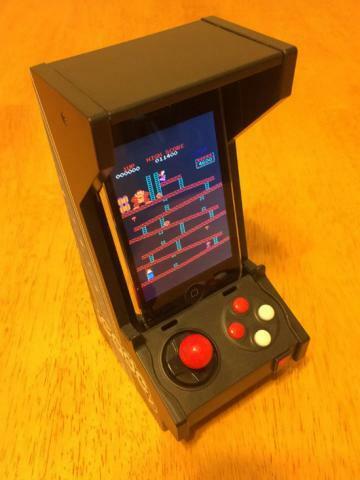 Old iPhone with iCade Jr.
Why buy a Kindle, if you have an old device in a drawer? There are Kindle apps for both Android and iOS that are very functional. I actually have a couple old iPod Touches around the house that do nothing but this—I have one by the couch and another by my bedside. Since the Kindle application syncs reading positions via the Amazon cloud, it provides a seamless way for me just to grab a device and read for a while. It may be a bit overkill, even lazy, but it keeps the old devices out of the desk drawer. Much like the media player option, you can dedicate a device to being a Pandora, Spotify or Rdio streamer. If you've got a stereo receiver in your house, you even could wire it in semi-permanently and never use physical media again. Dashboard-mounted cameras aren't only for people in Russia to post videos to YouTube. They can be beneficial for lots of other reasons too. I wish I had one to capture the antics of my daily commute. With an app called Daily Roads Voyager and a suction-cup dash mount, any Android device can become a dashcam. It'll loop the video so you don't have to worry about memory management, and it will correlate the video with a position on a GPS map. It could be handy in the event of an accident while driving. This tip really applies only if you've got a Motorola Android phone, like a Droid RAZR or Atrix, but at one point, Motorola made a Lapdock, which was a clamshell docking station for its handsets that included a large battery built in to the base, along with a USB connection for the built-in keyboard and touchpad, and a mini-HDMI connector for video. These Lapdock units originally sold for $500 or so when they were introduced, but now they can be found on eBay and Amazon.com for as little as $50. 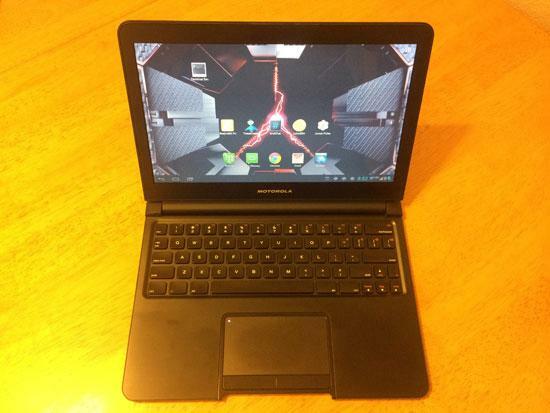 Depending on your Motorola device, the Lapdock may work out of the box, or you may have to modify the docking connector slightly. (I had to flip the orientation of the HDMI connector to get it to work with a Droid RAZR, for instance.) A bonus of having a Lapdock on hand—if you have a Raspberry Pi, the Lapdock can be modified to work with that as well. Linux Journal Editor Kyle Rankin's got one of these homemade creations and has said that it works surprisingly well. Only the curious need apply here, but it's a fun place to be. Due to the open-source nature of the Android operating system, lots of alternative ROMs have been released for various devices. The most prolific of these is the Cyanogenmod project. The Cyanogenmod folks have released ROMs for just about any Android device released to date. The Cyanogenmod project aims to release a basic, no-frills, yet stable Android product, unlike some versions of Android that device makers ship. The Cyanogenmod team's products also work on some of the oldest devices out there, like the T-Mobile G1. If you're in the mood to coax new life out of an old Android device, Cyanogenmod should be your first stop. If you're interested in digging deeper into the guts of your device, the XDA-Developers forum is a great place to find more esoteric ROMs and other information about your device. Many members of that community port newer ROMs to older devices, so be sure to look at the subforum that matches your hardware and see if you can find something cool to try out. Another fun little project that you can do with an older Android device is to repurpose it to be a low-power server. It's possible to install packages like Apache on Android if you know what you're doing, but there's an easier way. There's a package on the Google Play store called Servers Ultimate, and it enables all manner of servers, from httpd/Web, to Samba/CIFS, even VNC and SSH. There are optional "packs" of servers sold as add-ons to the main application, so you even can host your own Git server on an old phone, if you chose to do so. Install the free Gmote application on your device and its companion software on your computer, and you can turn your old phone or tablet into a wireless touchpad for your desktop PC. If you pair it with a laptop, you could use an old phone as a wireless presentation remote too! Tasker is an automation engine for Android devices. If you've ever tried the IFTTT Internet service, Tasker is similar to that, without the service, as it runs solely on your device. Tasker's built to run on your primary device, either a handset or tablet, but it's got some value for use on a secondary device. Imagine an alarm clock that would wake you up with a random song from your favorite playlist, and then do text-to-speech conversion on your incoming e-mail and read you your messages while you were waking up. That's the kind of thing that's possible with Tasker. Now that I've shown you a few ideas of what's possible with old devices you may have sitting in a drawer, maybe you'll think of a few ideas of your own. Get those devices out and start putting them to use! These little guys have as much processing power as full-fledged computers did just a few years ago, so they're still able to get some real work (or play) done. Feel free to experiment, and see what you can come up with! iOS devices can present their own challenges, but if you have one lying around, you still can sideload an alternate ROM onto it—assuming it's a supported model. Right now, Whited00r is the only option you've got, and you have to be on either an old iPhone 2G, 3G or iPod Touch 1G or 2G. It tries to backport a lot of Apple's iOS 7 look and feel as well as features to older hardware, and it succeeds...sort of. If you've got an older iOS device just sitting in a drawer though, and you're curious, it's worth a test drive.